- Zak Starkey is an English drummer, well-known as the first-born child of The Beatles drummer Ringo Starr (whose real name is Richard Starkey) and his first wife, Maureen Cox and also as the current drummer of Britpop band Oasis – one of the bands most influenced by his father’s. Zak is mostly noted for his unofficial membership in Oasis, being their third drummer. He joined the band in 2004, replacing longtime drummer Alan White. He subsequently performed on their sixth studio album Don’t Believe the Truth, released in 2005, toured in 2005-2006 and recorded in 2007 and 2008 for their seventh studio album, slated for release in 2008. Starkey was invited officially in the band in 2006, but such a move remains to be seen. Zak is the fourth drummer of the legendary classic rock band The Who, playing with them live and occasionally in the studio. He received very good reviews in this role for having a strong drumming presence but without explicitly imitating original Who drummer Keith Moon (who in fact was Zak’s first teacher). Both Pete Townshend and Roger Daltrey stated that he is the best drummer The Who has had since the death of Moon in 1978. Zak has also worked on session and touring basis with prominent artists like Johnny Marr, Paul Weller, The Icicle Works, the Waterboys, ASAP and the Lightning Seeds. Zak Starkey was born on September 13, 1965. His parents divorced on July 17, 1975, when he was 9. Ringo Starr afterward married Barbara Bach and Zak’s mother married Hard Rock Café founder Isaac Tigrett. Zak’s mother, Maureen Cox, died of leukemia in 1994, despite a bone marrow transplant for which Zak was the donor. Zak married Sarah Menikides in a secret register office wedding on January, 22 1985. Not even his parents were told of it until after the event, but shortly afterward Ringo Starr provided a small celebration party at Tittenhurst Park. On 7 September 1985, a week before his 20th birthday, his daughter Tatia Jayne was born, making his father the first grand-father Beatle. Starkey received his first drum kit from his father, although it is mistakenly reported that it was given to him by his idol, The Who‘s Keith Moon. Moon did, however, give Zak his first professional kit – one Moon previously used with The Who – and also some drumming lessons. At the age of eight, Starkey became interested in music. At ten, he started teaching himself how to play drums after receiving only one lesson from his famous father, who reportedly did not want him following in his footsteps. Although Ringo praises his son’s undeniable skills and talent, he said that he “always regarded Zak as a lawyer or as a doctor”, not a drummer like himself. By the age of 12, Starkey was already performing in pubs with a band. In his teens, Starkey was a member of a garage act, the Next. Although Zak had previously worked with John Entwistle in Ringo Starr and His All-Starr Band tours, he received his first opportunity to work with The Who in 1994, with Roger Daltrey in his “Daltrey Sings Townshend” tour. This tour developed from a two night performance at Carnegie Hall to celebrate Daltrey’s fiftieth birthday, when he afterward recruited John Entwistle, Simon Townshend and Zak Starkey to complete a U.S. tour. In 1996, Starkey left his band Face, to work with The Who on their Quadrophenia tour. He received very good reviews in this role for being a strong drumming presence but without explicitly imitating Moon. Zak was the full-time drummer for The Who beginning with their 1996 Quadrophenia Tour. Both Townshend and Daltrey stated that he is the best drummer The Who had since the death of original drummer Keith Moon. He provided drumming for one track on The Who‘s 2006 album Endless Wire, and for two new tracks released in 2004 on The Who: Then and Now. However, he was unable to provide the drumming for the EP Wire & Glass or the album Endless Wire because he was on tour with Oasis at the time Townshend recorded the songs. Starkey worked with The Who on The Who Tour 2006-2007, which was to finish in Glastonbury in 2007. It finished at Hartwall Areena in Helsinki, Finland on 9 July. According to Pete Townshend’s official web site, Zak was invited to become a full member of The Who, but he declined. Also the tour was supposed to continue till November and December. However Zak wanted to continue his work in Oasis, so declined a spot in the band and the touring plans had to be postponed. Starkey participated in every show on Oasis‘ 2005/2006 world tour and also appeared in the promo videos for the singles. However, as he was not an official member of the band, he rarely appeared with the rest of the band in promotional activities such as interviews and photo shoots. 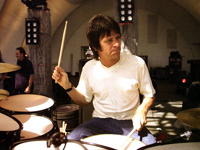 After the end of tours in April, Noel Gallagher confirmed that Starkey was invited to be Oasis‘ official drummer, but that couldn’t materialize before his current working engagements with The Who are completed in mid-2007. In February 14, Starkey sat behind the drums when Oasis received the BRIT Award for Outstanding contribution to music. The band played a set consisting of “Cigarettes & Alcohol”, “The Meaning of Soul”, “Morning Glory”, “Don’t Look Back in Anger” and “Rock ‘n’ Roll Star”. Zak is still unconfirmed as an official member of the band. His participation in the making of the band’s seventh album however was confirmed on December 11, 2007 when the official Oasis website published a picture of him in the studio with the other members. Also it was confirmed that he will tour behind the new release. There are evidences to suggest that Zak will finally become official member of the band as the Oasis MySpace page put it as a front pic. Also in March 2007 the band decided to pay their previous drummer Alan White around ₤350 000 in order to buy him out of their company Definitely Maybe – probably a move to free a place to Zak Starkey in the band and their company. In the early 80s Starkey landed work with a re-formed Spencer Davis Group. In 1985, shortly after getting married, Starkey released a musical version of Wind in the Willows with Eddie Hardin. In 1985, both he and his father Ringo Starr played drums on the recording Sun City by Artists United Against Apartheid. In 1988, Starkey replaced Chris Sharrock as the drummer in The Icicle Works. He left the band in 1989, and did not appear on any Icicle Works recordings, although a B-side later issued by Icicle Works leader Ian McNabb featured Starkey on drums, and is presumed to actually date from Starkey’s tenure with the group. Zak played on Silver and Gold a solo album released by Iron Maiden guitarist Adrian Smith in 1989. In 2000 Starkey was a founding member of Johnny Marr & The Healers, debuting with Boomslang three years later. There were rumours about a second album and short tour in 2004 and 2005, which were clashed when Starkey joined Oasis.